BOM has always been concerned about the rising burden of government debt interest, and we've blogged it many times. But we must admit that so far, it has not been quite the problem we feared. 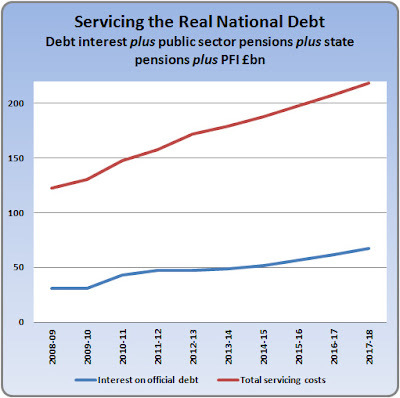 In fact, in the two years since we clocked off, official debt interest has only increased by £4bn pa - a surprisingly small sum when set against annual borrowing of £100bn plus. The reason of course is that for the last five years government borrowing costs - gilt yields - have remained at historically very low levels. Right now, the yield on ten-year gilts is back below 2%, which means new borrowing is cheap, and refinancing old maturing gilts with much higher yields actually cuts overall debt interest payments. So the doomsday machine has remained quietly dormant, at least for taxpayers (although savers and retirees taking out annuities have suffered grievously from low interest rates). However, nobody should assume this situation will last for another five years. For one thing, the Bank of England will not go on buying up the government's debt indefinitely. The bulk of its £375bn Quantitative Easing asset purchases have been government debt, and when the QE programme ends, so will the purchases. At a stroke, one of the main factors holding down gilt yields will be removed. Second, all around the world central banks are pumping money into their sickly economies. So far inflation has been quiescent, but the lesson of history is that sooner or later, open money sluices overflow into raging inflation. Bond investors head for the hills, bond prices sink and yields surge. There's no good reason to think this time will be any different. 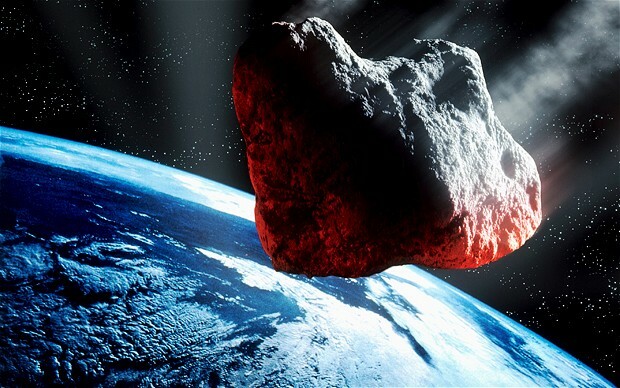 True, the official debt interest projections do not incorporate this doomsday outlook. They assume that gilt yields will rise gradually to just 3.4% by 2017-18. 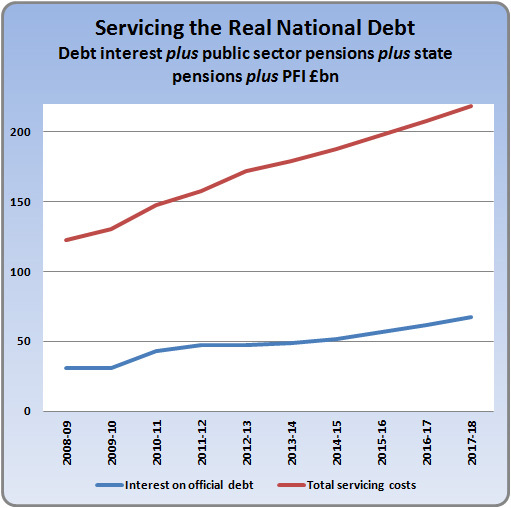 But they also tell us that every one percentage point above their base assumption adds another £8bn pa to debt interest by the end of the period. So even if yields merely returned to their average during the decade immediately before the Crash, it would add £12-15bn to annual debt interest. And if inflation does take off, yields will go a lot higher. What we're saying here is that by 2017-18, payments in respect of the government's past debt obligations will amount to £200bn pa. Which means that getting on for one-third of everything taxpayers hand over is going to service debt. The amount left over for everything else - health, education, defence, law and order, and all - will be severely squeezed. Doomsday may have been deferred, but even without the likely blow-out in the gilt market, servicing the government's debts is set to make life increasingly difficult. 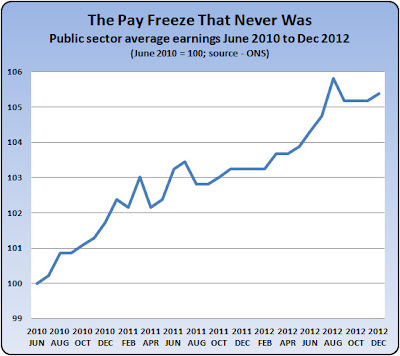 Back in his first budget in 2010, George Osborne imposed a two-year public sector pay freeze. It supposedly applied to all staff except the low paid, who were to get a flat £250 annual increase. Moreover, while the official ONS earnings stats show a 5% increase, calculations based on dividing the total pay bill by the number of employees suggest the true pay increase may well have been closer to 10%. 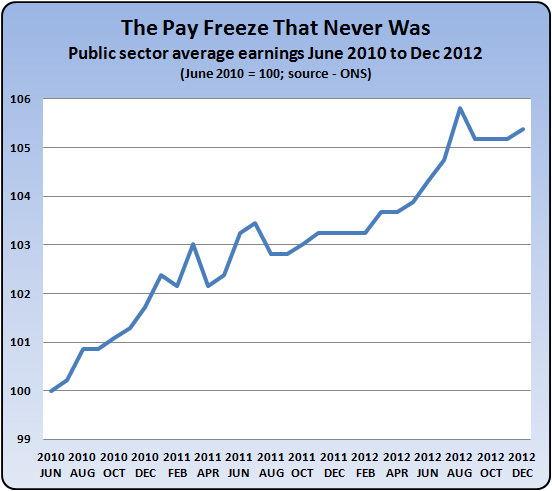 The pay freeze was a key element in George's attempt to curtail spending, so this is a serious failure. With a starting pay bill of around £170bn, a 5% overshoot is getting on for £10bn pa, and a 10% overshoot closer to £20bn. Annually. Well, some of it - maybe one percent - is explained by the decision to exempt lower paid employees. Some may be explained by changes in the composition of the workforce. But most of the overshoot almost certainly reflects the operation of our old friend the incremental scale. Virtually unknown in the private sector, this is the long-established practice of giving public employees guaranteed annual pay increases simply for serving another year. So for example, a newly qualified teacher generally starts on a salary of £21,588 (outside London). But she is starting at the foot of an incremental scale which then carries her up to £31,552 within 5 years - an almost 50% increase which is awarded irrespective of fiscal restraint or a Chancellor's freeze. Yes, of course, experience does generally make employees more valuable, and over time we'd expect to see that reflected in pay. But in most of the private sector, increases are never automatic, and in tough times for the business a pay freeze generally means just that - a freeze for everyone, irrespective of their additional experience and overall merit. The viability of the business must come first, with the understanding that individual injustices can always be righted once the crisis is past. And remember that this non-freeze comes on top of public sector pay that is already excessive against private sector equivalents. According to the ONS, on a like-for-like basis public sector pay rates currently exceed private sector by around 7%. The Institute for Fiscal Studies comes up with a similar 8% figure. And on top of that, 80% of public sector employees still enjoy index-linked final salary pensions that are simply not available to most private sector employees: indeed, only around 10% of private sector workers now have any final salary pension. How much is that worth? A lot: previous estimates suggest that higher average employer pension contributions in the public sector boost total rewards by about 10%. And in addition - even after recent reforms - public sector pension contributions are insufficient to fund the projected final cost of the pensions themselves. The difference will have to be made up by taxpayers, which adds further to overall rewards in the public sector. In the BOM book (chapter 2) we present estimates suggesting the overall overpayment - taking account of both the pay premium and the pensions benefit - is of the order of 30-40%. In money terms that's somewhere in excess of £50bn pa, a sum that would go a long way towards cutting the deficit. With such a big annual overpayment, the failure of George's freeze is worrying. In fairness, he clearly recognises the problem, and has at least attempted to tackle it - both through pay and action to reform pensions. But he hasn't done enough. And replacing his freeze with a 1% future cap was most unwise. We will return to this. So How Are Those Cuts Coming Along? Are we quite sure these things work? When we left on our two year sabbatical at the start of 2011, public spending was running at an annual rate of £700bn (Total Managed Expenditure). Now we're back and the most recent official figures say it's running at £674bn (2012-13). So that's a cut of around £25bn in just two years. Fantastic! Ah... now we can see. It turns out that the official spending figure of £674bn is net of a £28bn inward transfer of assets from the Post Office pension fund. 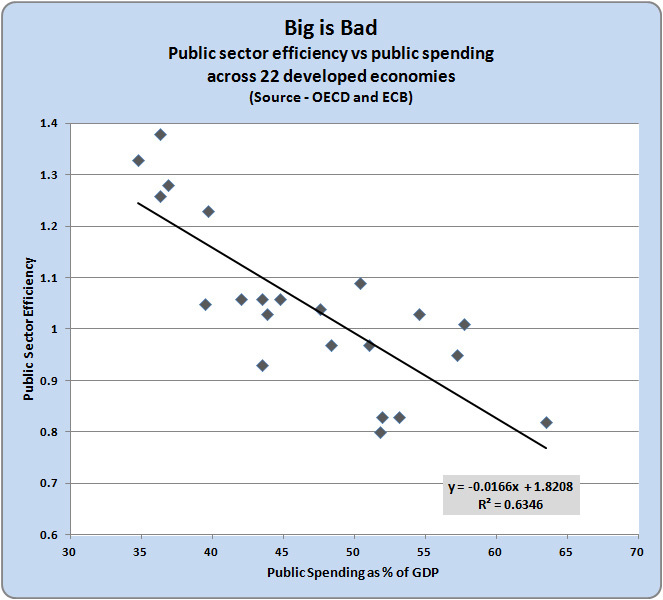 Removing that bit of jiggery-pokery, we discover that underlying spending is actually up. Moreover, if it hadn't been for a big fall in investment, the increase in overall spending would have been getting on for £20bn. Two days back, and we're already reminded never to take official headline numbers at face value. Looking forward from here, the most recent projection from the Office for Budget Responsibility (OBR) has spending continuing to rise, reaching £745bn by the time of the next election. So despite the talk, that's continued growth throughout the Parliament. Two years on, and we seem to be stuck in the same old place. 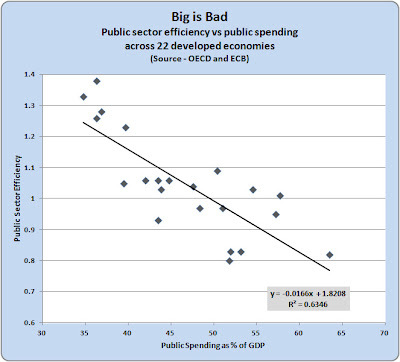 True, spending is down a bit from its peak between 2008 and 2010, but that simply reflects the completion of Crash related emergency capital spending. From here on, overall spending stays flat in real terms right through to the election. It's the next government that's meant to get the line heading down again. 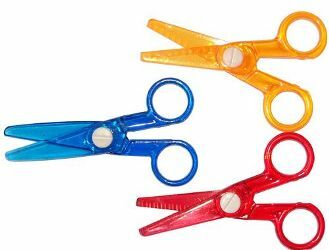 Cuts, what cuts? What the coalition is actually doing is to cap, not cut. The idea is that by holding the line on spending it will allow time for economic growth to do its magic work and boost tax revenues. 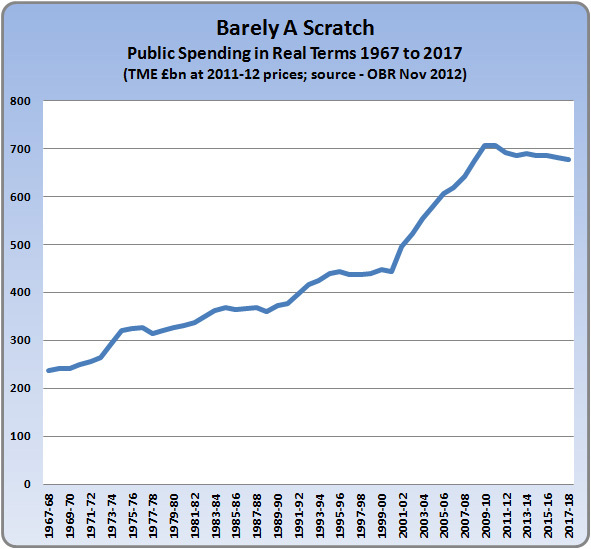 The public finances will eventually rebalance as revenue catches up with spending. Which is a great idea if you can somehow get some growth. In fact, it's pretty well what the Thatcher government did during the 1980s. 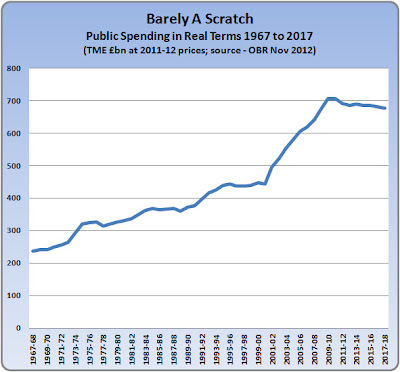 They never did manage to cut spending - as we can see from the chart - but they did sit on it for a prolonged period. And in their case, they did manage to get some growth going again so tax revenues grew strongly. Now, just remind me - how did they get that growth again? Wasn't there something about slashing tax rates and breaking up public sector monopolies? Next month George presents his third budget. He's already taken steps to cut taxes on enterprise and effort, but the clock is ticking louder now. We need to see more tax cuts. Spending? Well, as we argue in the book, tinkering around at the margins isn't going to do it. We need full-blooded structural reform to both public services and welfare entitlements. We'll be taking a closer look at both over coming weeks. PS Many thanks to all of you who've welcomed me back to the blogosphere. Quite a few of my must-read blogs - such as the good Doc Crippen - have disappeared over the last couple of years, which is a sad loss. Yes, it is a commitment, and yes, it can eat time, but blogging is still a great way to share ideas, and for those of us beyond the Westminster bubble it is a way of contributing to a wider debate. It took a whole lot longer than expected, but the book is finally written and published. Hurrah! 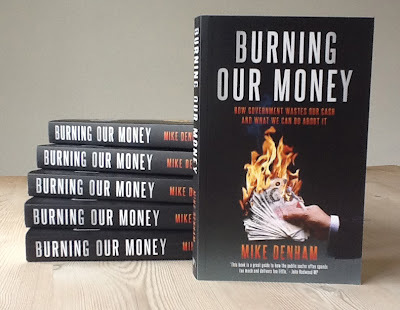 Imaginatively entitled Burning Our Money, it's available now from Biteback, Amazon, Waterstones, and all good booksellers. BOM the book draws together everything we've learned about government waste during six years of blogging it. The themes will be familiar to regular readers of the blog, but the book explores the issues in greater depth, setting out some possible solutions. And as always with BOM, there are plenty of facts and figures to support the analysis. Despite all that agonised wrangling over cuts, government still spends nearly half of everything we earn: the OECD says that government spending will consume 48% of our GDP this year, compared to the international average of 42% (chapter 1). The public sector routinely overpays for its supplies and labour, with staff getting substantially more than their private sector equivalents: depending on how you value those gold-plated pensions, labour costs are overrunning by as much as £60bn pa (chapter 2). Although NHS spending doubled under Labour, the NHS still underperforms overseas counterparts, causing thousands of avoidable deaths: according to the OECD 50,000 people under the age of 75 die every year from conditions that should have been treatable (chapter 4). Our government pays welfare benefits to three-quarters of British households, despite our high level of general prosperity (chapter 6). Our state schools are among the world's most expensive, yet performance is slipping down the international league tables and we suffer the worst social mobility (chapter 8). Our criminal justice system is the most expensive in the developed world, yet our crime rate is one of the highest (chapter 9). 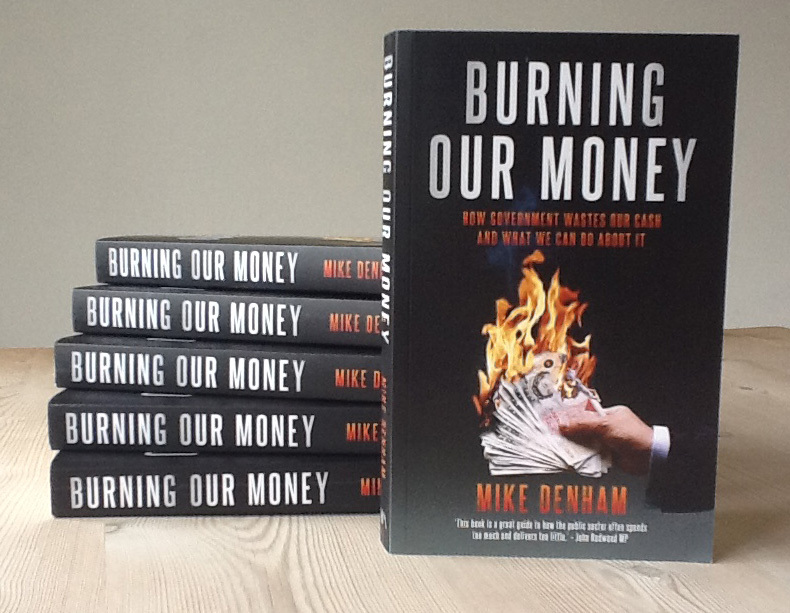 Compared to the most efficient governments elsewhere, ours wastes enough money to abolish income tax for everyone earning less than £50,000 (chapter 10). Despite promises of simplification and transparency, our government continues to hide its true costs behind a murky shroud of stealth taxation and disguised borrowing (chapters 11 and 12). 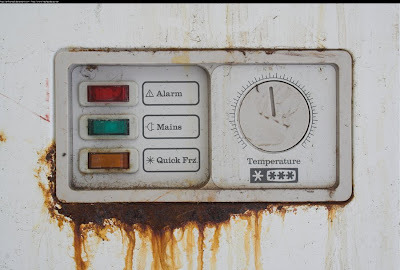 Of course, none of these issues are exactly new, but when we dwelt in the land of milk and honey - the one from which we were so cruelly ejected in 2008 - we reckoned we could defer them until another day. No longer. Out here in the chilly wastes of mountainous debts, broken banks, and marauding competitors, we must act or go under. When even the credit rating agencies recognise the problem, we have to act. Somehow we've got to grip government spending and bring it back down to a sustainable level - which we reckon is around 35% of GDP. Nobody says it will be easy, but it has to be done. And that's why we need to understand just how the government comes to waste so much of our cash. Because the irony of our present sticky position is that if we could somehow eliminate the waste, we'd pretty well eliminate the overspending problem - the numbers are that big. Beyond that, choice and competition work. Just like with our supermarkets, when the suppliers of health and education services have to compete for customers, efficiency is driven up - something we can see operating in health systems based on competing social insurers (chapter 5), decentralised public service systems with localised tax authorities (chapter 3), and increasingly in free school systems (chapter 6). And yes, supermarkets drop clangers too, but when they do so they have to put them right pronto: compare and contrast the speed with which Tesco moved to tackle its horsemeat disaster, with the long and shameful prevarication following recent disasters in the NHS (Mid-Staffs) and the BBC (Savile). As customers we have no effective power over tax-funded suppliers - they get paid however shockingly poor their service - and we can only watch as our politicos bicker over who's to blame. Far more powerful if suppliers who persistently fail us simply don't get any more of our business. And that's the main conclusion of the book. To achieve a serious reduction in government waste, we need a serious restructuring in the way public services are delivered and paid for. We need real choice and competition, which among other things, means breaking up the NHS, accelerating the move to school independence, and empowering local councils by decentralising the tax system (chapter 13). Restructuring like this will not be at all comfortable, and even worse, public service reform is only part of the discomfort. It's going to be just as necessary to cut welfare entitlements, and not only for those famous scroungers (chapter 8). Decent hard-working families and pensioners will also have to share the pain, with for example, the state pension age increasing to at least 70 (chapter 12). So refreshed by two years of intensive thinking about such unthinkables, it's back to the blog. 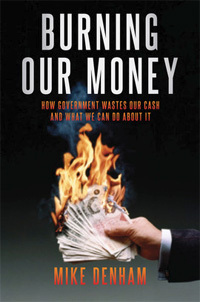 I do hope some of you will buy and read the book, not because I hope to get rich on the royalties, but because I think the issue of government waste needs far more public exposure than it gets. True, the awareness of waste has increased over the last decade, and the Coalition has taken a number of steps to address the issue. But there's much left to do, and the really tough decisions remain ahead of us. We just have to keep plugging away. PS Wat Tyler: after six years of non-stop blogging action, Tyler reckons he's too knackered to resume. So I'll be taking his place. Hopefully I can persuade Tyler's old muckers like the Major and Mr Gomulka to contribute their own bracing observations, just as they've done in the past. PPS In restarting the blog I've transferred it onto Blogger's new enhanced platform. It promises a better blogging experience going forward, but it does mean the blog no longer shows the old comment streams - sorry about that. We've also lost some of the blog-roll links and other side-bar items, but I will be able to reinstate them.